I love the Victorian coastline. There is something cathartic and beautiful about walking along the sand and seeing the waves in all their splendour. Life is put into perspective along these shores. 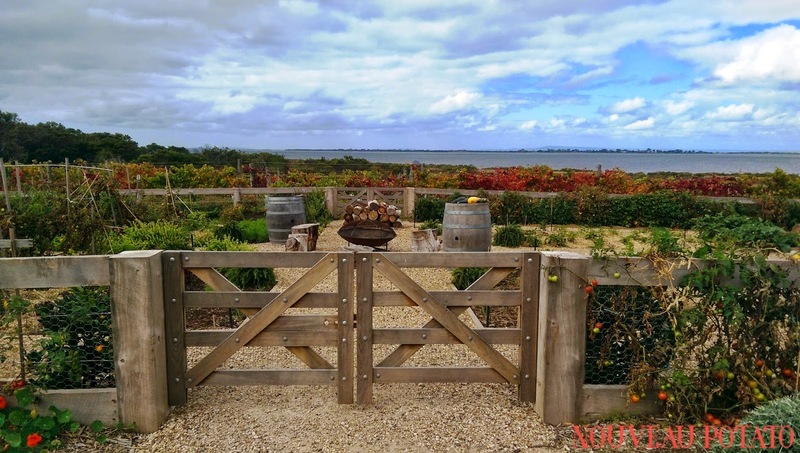 Over the recent Easter weekend, I was down at the Bellarine with family, eating, relaxing, sleeping and enjoying everyone’s company. I am surprised by how many wineries are popping up in the area, and encouraging myself to try them. I was introduced to Basil’s Farm by my parents’ friends. The first visit was a sunny day with ladies on a hen’s party spilling onto the lawns, pleasant wine to be drunk and platters of food and gazpacho to be enjoyed under the fig tree. This recent visit was my second and, despite the cold winds (blowing clothes and cups off tables and forcing us to wrap our jackets tightly), this spot continues to enchant me. It would be difficult to miss the winery with its banners up high and plentiful where the drive way meets the road. A short meander up the unsealed track and you will spot a green and pretty garden amongst the surrounding dry bush and gums. The garden includes veggies, herbs and fruits, and these can be tasted as part of a lunch platter. There is a small cellar door too where the latest vintages of Kiltynane and Basil’s farm can be tasted before selecting a bottle for lunch. The Basil’s Farm Pinot Noir was pleasant table wine, where the more premium Pinot can still be stored for a few years to come. We chose a table nearest the view of the sea and veggie patches, enjoying conversation as we nibbled on our shared platter for two. 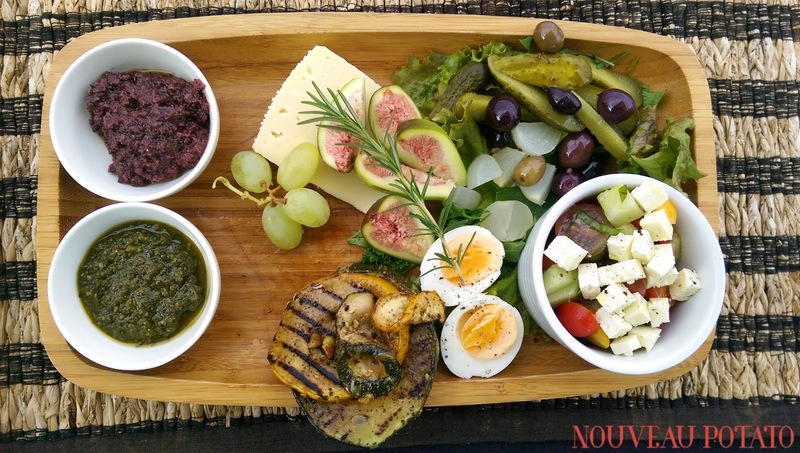 This features whatever is in season and today it was slices of fat grilled zucchini; a salad of cherry tomatoes, fetta, basil and onions; pickled cucumbers, onions and olives on a bed of lettuce; havarti cheese; figs; grapes, and; homemade dips of pesto and olive. The platter was accompanied by a bowl of warm, thinly sliced bread, which was refilled after we gobbled it up with the condiments. Even in the cool wind, we had no problem relaxing into our seats and enjoying the spread. There are also tables set up in the old farm house, turned gallery where an artist’s portraits of other artist were on display.